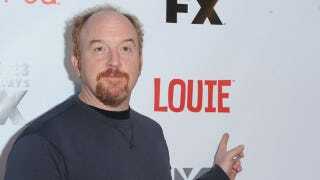 A Little Girl&apos;s Lesson In Fairness, Courtesy Of Louis C.K. Overall, I think it's a good time to have a girl in the 21st century because things are changing, with more opportunities for women. But girls are still the underdog, which means they'll work harder, and everybody loves an underdog. The next Steve Jobs will totally be a chick, because girls are No. 2—and No. 2 always wins in America. Apple was a No. 2 company for years, and Apple embodies a lot of what have been defined as feminine traits: an emphasis on intuitive design, intellect, a strong sense of creativity, and that striving to always make the greatest version of something. The fact that people have kids because they want something from them is bizarre. As soon as you have a child, that script gets flipped for the rest of your life anyway. It's not about you anymore. I say this so when you have a girl, you don't ask yourself: What am I going to get out of this girl? You're supposed to focus on: What does this girl need from me and what kind of parent do I need to be to her? That's the question you should be asking yourself right now, not whether or not you'll be missing some boy's stupid Little League game.